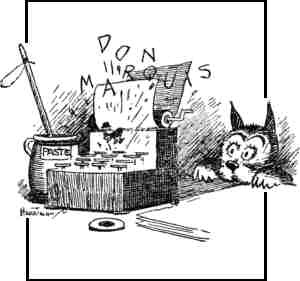 about the most famous work of newspaper columnist Don Marquis, archy and mehitabel. Krazy has been reprinted numerous times in the half-dozen decades since it stopped being produced on a regular basis — but his drawings of the Marquis characters have been continuously in print even longer than that. In fact, it's the Herriman contribution that calls for its inclusion here. In its original venue, Marquis's column, "The Sun Dial", which appeared in New York's Evening Sun, the "archy and mehitabel" feature consisted entirely of words, with no toon connection at all. From 1916, when it started, until September 11, 1922, when Marquis switched papers, and the N.Y. Tribune promoted the move with a picture of Archy by an unknown staff artist, nobody ever saw what either character looked like. Later, they transferred to Collier's magazine, still without illustration. But after they started appearing in book form, Herriman's drawings became so closely associated with the pair, that it's hard to believe they could ever appear any other way. Note on orthography: Their names are capitalized normally, except when Archy types them. He'd use normal capitalization too, but he's only a cockroach jumping up and down on Marquis's typewriter keyboard, and can't hold the shift key down while typing a letter. The name of the feature is usually capitalized the way Archy would type them, i.e., "archy and mehitabel" (he also can't handle the ampersand, and has trouble with punctuation all around), but the characters themselves are Archy the cockroach and Mehitabel the alley cat. Oh, and Marquis's name is pronounced MAR-kwiss, not, as the hyper-correct would have it, Mar-KEE. Aside from being a cockroach, Archy was also the reincarnation of a vers libre (free verse) poet. He made himself known to Marquis by jumping up and down on the keyboard all night, so the columnist would find his work the following morning. He first did this during March of the year 1916, and Marquis turned it in as part of his column for the 29th. A cat was mentioned in Archy's manuscript, but it was months before she had a name and personality. Mehitabel, it turned out, was the reincarnation of Cleopatra, as well as of any number of cheap floozies since then, who have trouble maintaining the dignity that was once theirs by natural right. Powered by Marquis's imagination, Archy proved quite the literary genius. Writing from an insect's point of view, he made sharp, incisive, not always very complimentary (but highly amusing) comments on the foibles and fallibilities of humanity. Mehitabel, too, had much to say (through Archy) about the human condition. And the human beings themselves liked it, as the first book collection (titled simply archy and mehitabel) was published by Doubleday in 1927 and has remained in print ever since. It was followed by archys life of mehitabel (1933) and archy does his part (1935). An omnibus volume, the lives and times of archy and mehitabel, which collected all three, came out in 1940. Herriman's art didn't appear in early editions, but once it was added it became indispensable. Don Marquis died in 1937, but his characters live on. In 1954, writer Joe Darion and composer George Kleinsinger (who also did the theme song of the Fleischer version of Rudolph the Red-Nosed Reindeer) adapted his work into a musical stage production. It was performed at New York's Town Hall during December of that year, with Jonathan Anderson as Archy and Mignon Dunn as Mehitabel. It was also produced as a sound recording, with Eddie Bracken (Mole in the 1987 production of The Wind in the Willows) as Archy and Carol Channing (Granny in the 1992 version of The Addams Family) as Mehitabel. Darion and Kleinsinger, with the help of the young Mel Brooks (who, among other things, later did the voice of Santa Claus in Jimmy Neutron), reworked it into a Broadway play. It opened April 13, 1957, under the name Shinbone Alley (which was where Mehitabel lived). This version was done in 1960 as an episode of National Educational Television's Play of the Week, with Tammy Grimes (Molly Grue in The Last Unicorn) as Mehitabel. Later, it was converted to an animated feature, released April 7, 1971. Bracken and Channing reprised their roles on both Broadway and the Big Screen. None of these productions were great commercial successes, but they were loved by those who know the characters (tho critics did deplore Archy being in love with Mehitabel in this version). In 1986, long-forgotten Marquis manuscripts were unearthed from a trunk that had belonged to Marquis's sister, and several were re-published, with illustrations by Edward Gorey (The Wuggly Ump). Ten years later, they and a few dozen more were collected into a new book, Archyology: the long lost tales of archy and mehitabel. Another book, archyology ii: the final dig, was published in 1998. Both were illustrated by Ed Frascino. Marquis's work remains in print to this day. Several Web sites are devoted to it. Shinbone Alley is still performed by theatre groups all over the world. Originally published in that most ephemeral of mass media, the daily newspaper, the archy and mehitabel feature has achieved immortality that most playwrights, novelists and composers can only envy. Purchase archy and mehitabel online. Text ©2006-9 Donald D. Markstein. Art © Don Marquis estate.